As I discovered when I could give a try to the 3Doodler handheld 3d printer back in March, 3d sketching in the air can totally be great fun. Let’s make it clear, you won’t create any flying machines or 3d printed musical instruments but it is possible to serve up something more elaborate than a squiggle ball with a little practice. The only problem with the original 3d printing pen construction is that it’s way too heavy to create precise drawings and is uncomfortable to use after a while. Just like in most cases of the 3d printing industry, after the successful kickstarter project of the doodler, a lot of chinese clones appeared on the market. The only problem with chinese suppliers is that you never can trust any quality values and replacing parts or getting support might be an impossible mission as well. You’d better get your 3d printing pen at a local supplier who cares about warranty – and if not, it will have consequences – and this way you can feel safe with your brand new 3d printing device. But parents, please take care if you want to buy a 3d printing pen for Christmas, the tip of the machine can be really hot which can easily burn one’s hands! So please make sure that you child won’t touch the nozzle while sing the 3d printing pen, and you better do not leave it alone with it. In this blog post I would like to show you a brand new 3d printing pen, this one is from the Belgian company called Velleman. 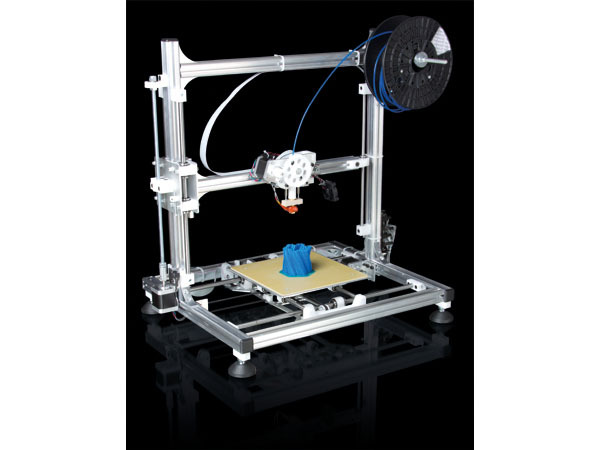 Their amazingly popular K8200 DIY 3D printer KIT made them recognized in the worldwide maker community, although they’ve been producing DIY electronic kits like arduino shield and other professional electronic solutions for decades now. The new 3d printing pen has got some benefits and useful features like the 1.75 mm filament mechanism, which allows you to use any 3d printer filament from the cheapest PLA 3d printing filament rolls to the premium quality filament spools which allows you to 3d printsketch with wood or sandstone instead of being bound to expensive filament sticks. There is a real 3d printer extrusion mechanism trapped inside the cigar shaped device. On the whole, many things has changed to the 3d printing pen’s shell design since the designers of the 3d doodler created their successful kickstarter project. The oblong device is covered in a white and blue hard plastic casing. It’s lightweight and easy to hold between your thumb, index and middle finger, just like a thicker ink pen. 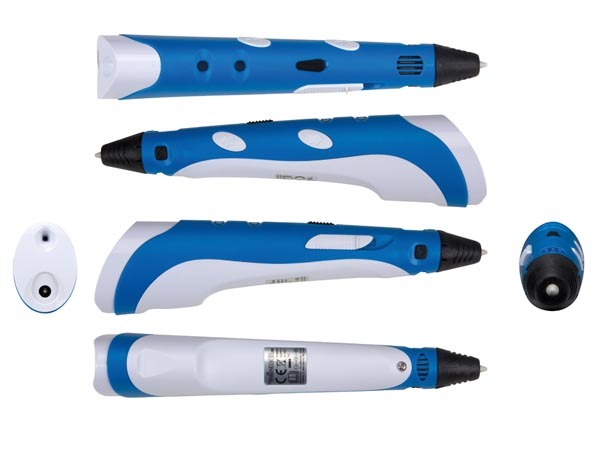 And how does the Velleman 3d printing pen work? Literally, it is a small 3d printer extrusion mechanism integrated in a pen-shaped case, which melts and extrudes 1.75 mm thermoplastic filament sticks which can be deposited anywhere from ground instead of the layer-by-layer modeling technology of the desktop 3d printers. This gives you the possibility to build an huge variety of geometries and structures with ease! Most people will instantly be able to trace objects on paper, and after only a few hours of practice you will be able to make far more intricate objects. Just like a glue gun, but this 3d printing device doesn’t extrude thick plastic stick. This 3d printing pen extrudes heated 1.75 mm filament (PLA or ABS, which filament cools down once it’s out of the nozzle. This allows you to build 3D structures and shapes. Why is it better, than the Doodler? Because it is lighter, easier to use: you only have to plug in your 3d printing pen and wait until it heats the extruder. Once the wanted the temperature achieved, you can set up the speed of extrusion and start creating some magic! Especially for the holidays, just think about some awesome, lightweight truss-like christmas ornaments with your 3d pen! You can use any kind of 1.75 mm 3d printer filament in any colors, GigamaX3D also offer special 3d printing pen packages including some rolls of premium 3d printer filament or conductive 3d printing plastics. 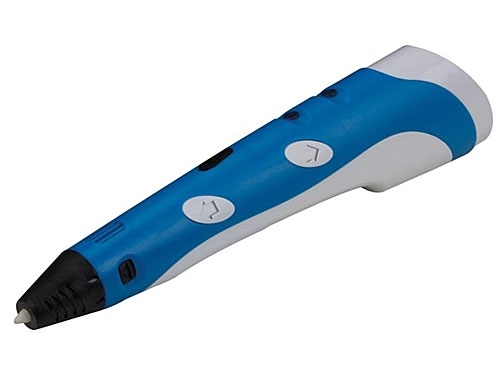 Who is the Velleman 3d printing pen for? For anyone who would like to draw in the air! It is a toy for adults, not for your children! It is not allowed at the age of 12 but your older teenager children would surely like it! I also have purchased my own copy because I though it will be a nice part and a great additional tool of my 3d printer collection. I already have a Flashforge Creator X Dual extruder 3d printer, which is a great copy of the Makerbot Replicator 2, which I also own. The Rep2 has been modded, it has an open-source controller and runs sailfish now, because I don’t want to be bound to MB’s presets or adjust the setting in text editor while modifying the profile files. I also have a Velleman K8200 open-source 3d printer kit, but I don’t use it for 3d printing: I’ve turned it with some open-source upgrade parts and a Proxon drilling machine into a simple CNC mill which can engrave or mill PCBs or soft materials like Styrofoam. The next thing I want to give a try to is the chocolate extruder, as you can see it on this video, it can print a chocolate mug on your toast for a delicious breakfast at the holidays! And if you want to complete your 3d printer setup, you also should have a 3d scanner which allows you to capture your environment in 3d and prepare it for 3d printing! You also can draw some hair or make-up on a 3d printed sculpture like these 3d printed Halloween monsters. If you already are a 3d printer owner and maker, you can fix and repair your failed prints with your 3d printing pen. Just fill the holes, glue broken parts or pimp some old and failed plastic parts and turn them into some piece of art! 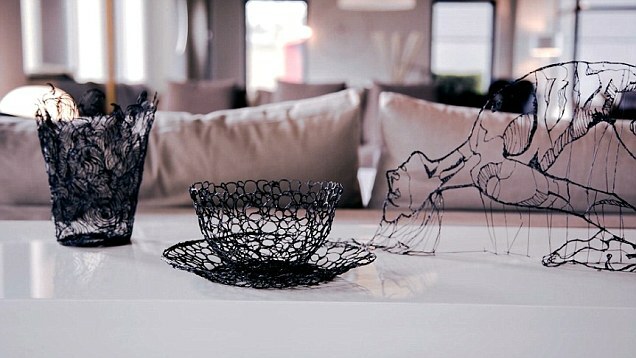 In forthcoming world of new devices like 3d scanner and 3d printers, the Velleman 3d printing pen offers something creative, special and unique, allowing you to create strange new works of art – and it is truly affordable and a great xmas gift for about 70 Euros, including some spools of 3d printer filament. The 3d printing pen may look like a tech gift for 3d printing enthusiasts but thanks to its easy-to-use mechanism it can be a creative tool for everybody who like making things on their own! You also can print some graphic pattern on your 2d printer and then draw it with you 3d printing pen using heat-resistant translucent kapton tape on it! Have you ever tried a 3d printing pen? Come visit the GigamaX 3D Printing Studio in Budapest to test all their 3d printing, 3d scanning devices, you also can see how the Velleman 3d printing pen works! If you are from the EU, you can easily purchase your 3d printing related stuff on their 3d print webshop, the shipping costs are about 10-15 Euros under 10 kg across the continent so it isn’t a big deal to order some 3d printer parts, 3d printing materials or an affordable desktop 3d scanner for Christmas. By the way, have you 3dprinted something scary for Halloween? I’ve just checked these 3d prints from parametric | art, a Hungarian 3d designer and 3d printer guy, who also uses GigamaX3D’s filaments and 3d printers. Check out his blog post about 3d printed Halloween decoration, if you want some great downloadable 3d printable models!